Subject: 11th Annual Golden Geek Awards Winners for 2016! 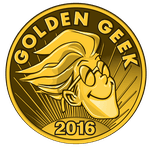 The winners of the 11th Annual Golden Geek Awards for 2016 have been determined by the users of BoardGameGeek, RPGGeek, and VideoGameGeek. Here is the complete list of winners and runners up in all categories. Runner Up - Sushi Go Party! Oh my goodness, thanks everyone! Imhotep- always a brides maid, never a bride. Also, clearly the Scythe players were out in force. TM just kept coming in second. I guess now we can all breathe a Scythe of relief! Results are like I predicted - according to current games popularity. Viticulture is my #1 favorite game!! You honestly think I've never fenced before? Boring and completely predictable. Scythe for GOTY, Strategy and Thematic? Plus solo, and runner up for Innovative (!)... it's pretty much a repeat of last year. I said it then with Pandemic Legacy and I'll say it again now: I know it's people's choice and all, but as long as the voting system remains this way and *any* vote is better than N/A, the most popular/hyped game of the year will win every category every time. Oh well. Can't wait to see what the 2017 one will be, if not Pandemic Legacy Season 2. Thanks, BGG! I'm happy that some people have had fun playing Scythe. I'm very fortunate to work with an amazing solo designer (Morten Monrad Pedersen), a brilliant artist and worldbuilder (Jakub Rozalski), Chris at Panda Game Manufacturing, all of the playtesters and Kickstarter backers, and everyone else who helped me bring Scythe to life. I guess I need to go listen to One Shot, because it must be mind-blowing if it beat out The Adventure Zone. Good on GMT taking the wargame slots, LoD and FS are great. It was good to see Hands in the Sea and Bios Genesis in the running too. Does anyone know how to contact Aldie? Or is there any place he expains why he chooses the current voting mechanism? The voting mechanism for these awards is extremely questionable. I've tried to contact him a bunch of times already but he never replies. As it is these awards are a joke sadly. Games which are more familiar and easier to get a play of are heavily advantaged. A game with limited sales has a big disadvantage. Hopefully Aldie can reply or at least defend the choice for the Schulze method for these awards. Big fan of the show. Well deserved. I didn't find this edifying at all. I tried my best to hate vote it out of the lead, but it was just too popular. well at least it's not the a complete embarrassment like last year. Marvel Dice Masters: Avengers vs. X-Men had limited sales in 2014 but did got a nominee anyway. I'm just glad the Hitler game didn't win. True. But boring then one game wins that many categories, eg. both best strategy game and best thematic game. I don't know that there's anything in Scythe truly innovative to even have it up for consideration of that award, but the rest of the awards and runner-ups are all pretty good choices. I concede Scythe for some things but just kind of shake my head on others. People who voted it for innovative clearly didn't play something like Vast and are going to get their mind blown when they play Gloomhaven. It is almost like anything not a pure retread is innovative these days.